People have built tons of cool stuff with our API - often during hackathons. Check out some of the apps for inspiration. If you have built something with our API, let us know and we'll add you here! You can ask wine pairing to recommend wines to go with a large variety of dishes. Simply tell Alexa to ask wine pairing for the best wine for steak or whatever you're planning to eat. You'll find out which types of wines work best and get one specific recommendation for a highly rated wine. You can also ask for meal recommendations for a wine you plan on drinking, or simply ask for a good wine that fits your budget. Finally, a wine and food pairing skill that is informative and helpful! Tap'N'Cook provides users with simple yet delicious recipes using ingredients they have left in their fridge. With a database that contains over 350,000 recipes and 10,000 ingredients to choose from, users are guaranteed to always find a relevant recipe suited to their tastes. This app was carefully designed for people who want to prepare meals for themselves or for their friends but don't necessarily have the experience to prepare anything else apart from the basic eggs and chips or spaghetti or the very basic cuisine that more or less all of us do know how to cook. 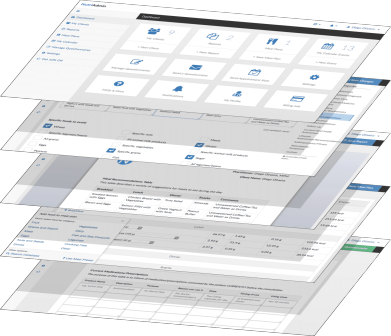 NutriAdmin makes managing your practice effortless. All our features are designed to handle the business side of your nutrition practice, cutting down paperwork by half. This application is very comprehensive and targeted to professionals. Kitchen Wizard makes cooking easier. Featured by BuzzFeed as one of the best apps for the kitchen, we find you recipes that fit your diet based on the ingredients you have on hand. We’ll send you reminders to use food up so you throw out less, and we’ll suggest recipes for meal plans and shopping so your kitchen goes on auto-pilot. Filter recipes by cocktails, dinners, desserts, and more! Trying to live the Paleo Diet or Primal lifestyle but struggling with recipe boredom? Paleo CookBook is full of wide variety of hundreds of great Paleo Diet recipes for main courses, side dishes, appetizers, desserts, soups, salads and drinks. Recipes are included with step-by-step instructions and nutritional information including macronutrients (calories, fat, carbohydrates, protein) and micronutrients (vitamins and minerals) so you can choose the recipe that is right for you. Voila – a compendium of real recipes to suit ingredients you actually have in the house. How often have you skimmed through a recipe book and been put off by the shopping list, required before you can even think about eating? Or found that none of the recipes cater for allergies or special dietary requirements? Voila is a directory of real, tried and tested recipes with a range of categories catering for every taste. But what’s so special about Voila, is the filter feature. With nutritional information, calorie counters, cooking times, weight watcher points, detailed methods, all wrapped up in a delicious design which places everything just a tap away from your taste buds. Of course, we don’t want to get rid of shopping lists completely, it’s good to expand your horizons – so we include a handy section to store your favourite recipes along with a shopping list of ingredients which you can pick up for next time… but right now, open your cupboards, tell us what you’ve got and Voila – You’ll be amazed what you can cook up! We're all afraid of not having enough food or few ingredients. Or do not eat healthy because we do not know how to cook, or how many calories in each meal. Now with the Ji3an app, do not look over hundreds of cookbooks. Put your grocery list in our app. And let us give you some recipe suggestions. Taste healthy, hearty and the most insane delicious nibble. Control your diet, depending on how your family eats. Give yourself unique specialties and recipes every day. Sublimemeal gives you suggestions for what you could eat for your next breakfast, lunch, or dinner. Simple and effective. Find multiple recipes that, when added up reach your daily caloric needs.  Simply enter your desired caloric intake for the day, and the app will produce the meals for you. A very quick meal planning app for those that are counting calories. 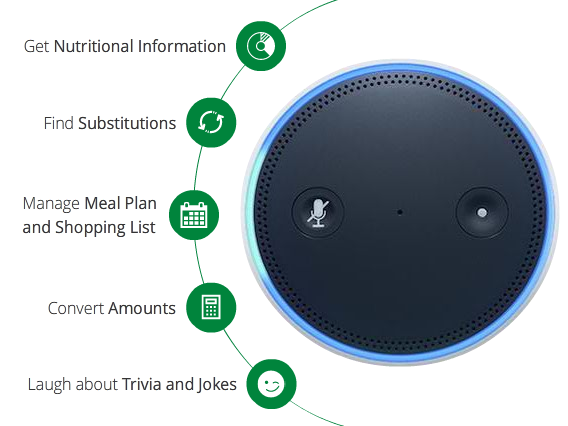 This alexa skill helps you manage your food from meal plan to shopping list. You can link it to your account and simply add meals to the meal planner or learn some food trivia. When cooking this skill can help you find ingredient substitutes, convert amounts and units, and even tell you nutritional information about your ingredients. What's Cooking finds recipes that use as many of the given ingredients as possible and have as little as possible missing ingredients. It shows you the instructions of the recipe too. Get started by saying something like "Alexa Ask what's cooking give me recipe for chicken". You can add or remove ingredients. Say 'no' to get the next recipe and say 'yes' to get the instructions. The spoonacular nutrition helper lets you ask simple questions such as "vitamin c in 1 apple" or "how many calories are in 5 ounces of butter". spoonacular will compute a precise answer and give it back to you. The spoonacular recipe saver/recipe clipper makes it easy to save or clip recipes from numerous websites and organize them into personalized online recipe boxes. You can then use the recipe search field to find the right recipes quickly, whether "beef stew with wine" or "gluten free cake." You can also use your saved recipes in our easy-to-use weekly meal planner and email your shopping list to yourself or to family. Finally — one app that helps you find and manage recipes, make meal plans, automatically calculate your daily nutritional information, stick to your budget, AND make your shopping list in seconds. Our meal planner and food/recipe manager is easy to use and syncs automatically with our website, so you can keep track of your favorite recipes and grocery products and monitor your nutritional goals wherever you are. If you think using a meal planner/food tracker is too difficult and time consuming, download spoonacular and let us show you how we make meal planning quick and easy. If you have any questions, suggestions, or feature requests, please get in touch so we can help. Manage your pantry and find recipes based on what you have on hand. Recip-e allows you to search for recipes using the ingredients that you have in your kitchen or pantry. With a simple to use mobile first interface you can add and remove items to your pantry list and search any combination of them for recipes.